To find instances of a specific symbol in your Qt C++ project, place the cursor on the symbol in the editor and select Tools > C++ > Find References to Symbol Under Cursor or press Ctrl+Shift+U. Note: You can also select Edit > Find/Replace > Advanced Find > C++ Symbols to search for classes, functions, enums, and declarations either from files listed as part of the project or from all files that are used by the code, such as include files. To find instances of a specific QML type in a project, place the cursor on the type and select Tools > QML/JS > Find References to Symbol Under Cursor or press Ctrl+Shift+U. The Search Results pane shows the location and number of search hits in the current project. To move between instances, click the (Next Item) button and (Previous Item) button in the Search Results pane. To expand and collapse the list of all instances, click the (Expand All) button. To clear the search results, click the (Clear) button. To start a new search, click the (New Search) button. You can rename symbols in all files in a project. When you rename a class, you can also change filenames that match the class name. To rename a specific symbol in a Qt project, place the cursor on it and select Tools > C++ > Rename Symbol Under Cursor or press Ctrl+Shift+R. To rename a QML type in a project, select Tools > QML/JS > Rename Symbol Under Cursor or press Ctrl+Shift+R. The Search Results pane shows the location and number of instances of the symbol in the current project. To replace all selected instances, enter the name of the new symbol in the Replace with text box, and select Replace. To omit an instance, deselect the check box next to the instance. If the symbol is a class, select the Rename files check box to also change the filenames that match the class name. To apply a change to several rows in a column simultaneously, press Alt, select the rows, and enter or remove text. The changes are made simultaneously at the cursor position on all the selected rows. 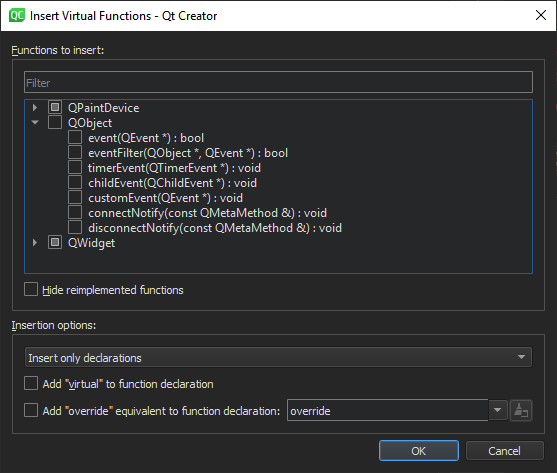 Qt Creator allows you to quickly and conveniently apply actions to refactor your code by selecting them in a context menu. The actions available depend on the position of the cursor in the code editor. To apply refactoring actions to C++ code, right-click an operand, conditional statement, string, or name to open a context menu. To apply refactoring actions to QML code, right-click an item ID or name. In the context menu, select Refactoring and then select a refactoring action. You can also press Alt+Enter to open a context menu that contains refactoring actions available in the current cursor position. If you use the Clang code model to parse the C++ files, the Clang fix-it hints that have been integrated into Qt Creator are also available to you. In addition to the standard ways of activating refactoring actions, you can select the actions that are applicable on a line in the context menu in the left margin of the code editor. The following table summarizes the refactoring actions for C++ code. The action is available when the cursor is in the position described in the Activation column. Add Definition in ... Inserts a definition stub for a function declaration either in the header file (inside or outside the class) or in the implementation file. For free functions, inserts the definition after the declaration of the function or in the implementation file. Qualified names are minimized when possible, instead of always being fully expanded. Reformat Pointers or References Reformats declarations with pointers or references according to the code style settings for the current project. In case no project is open, the current global code style settings are used. When applied to selections, all suitable declarations in the selection are rewritten. Insert declarations and the corresponding definitions inside the class. Insert declarations and the corresponding definitions outside the class. Insert declarations and the corresponding definitions in the implementation file (only if an implementation file exists). This operation is limited to work only within function scope. Also, the coding style for pointers and references is not respected yet. The following table summarizes the refactoring actions for QML code. The action is available when the cursor is in the position described in the Activation column. 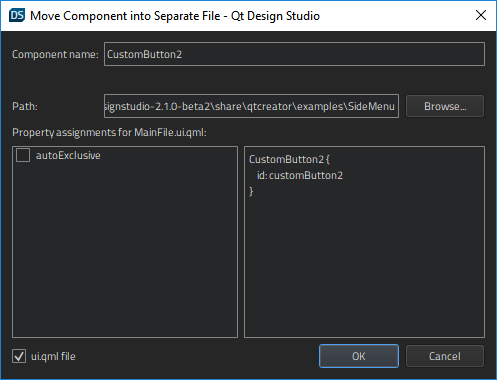 Move Component into Separate File Moves a QML type into a separate file. Give the new component a name and select whether properties are set for the new component or for the original one. QML type name. This action is also available in the Form Editor in the Design mode.